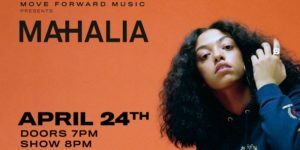 An intimate evening with Mahalia, at the legendary home of music, SOB’s, presented by Move Forward Music. Leicester native Mahalia enjoyed an incredible 2018, quickly becoming one of the year’s most exciting UK female artists. She rode fast in her own lane, winning YouTube’s inaugural ‘One To Watch’ list and soon after became the only musician to be tipped for the BRIT’s Critics Choice Award and the BBC Sound Poll shortlists in the same year. Mahalia found success via her uncompromising, buoyant songs such as ‘One Night Only’, a single which was taken from her hotly acclaimed 2018 EP ‘Seasons’. Following the release, Mahalia graced the Berlin online platform COLORS, where her performance of ‘Sober’ went viral and has since accumulated over 24 million views! At 12 years old –the age most of us are aimlessly riding bikes or trying to avoid homework –Mahalia was cradling her guitar and penning love songs. With her entrancing, soulful tones, wise-yet-relatable wordplay and intuitive sense of melody, it quickly became clear that she had an innate musicality and that she’d be doing this for the rest of her life. In the time since she first picked up that guitar she’s dropped a scattering of releases –from 2012’s indie-flecked acoustic dream ‘Head Space’ to 2015’s gorgeously understated 4-track EP ‘Never Change’–and 2016’s genre-flipping mixtape ‘Diary of Me’. But for Mahalia, it feels as if she’s just getting started.